It’s occurred to me that over the past 3 years, I’ve visited Germany in every one of those years at some point. 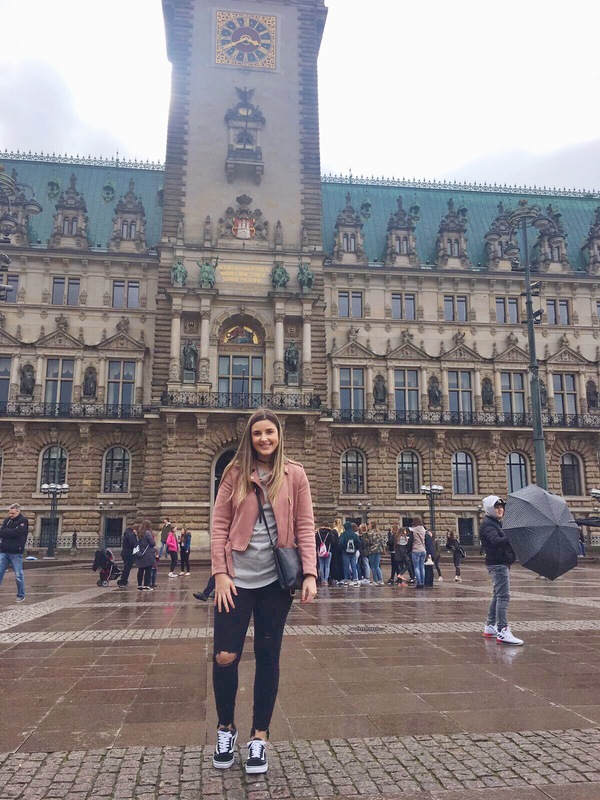 My 1st time was a ‘gals weekend’ visiting our friend in Nuremberg where she’s living the dream working incredibly hard for Adidas. You go gal. We went at the end of November in 2015 so the world renown Christmas Markets were in full flow and we got to wrap up and walk the streets drinking baileys and hot chocolate mixed with lots of beer and lots of gin whilst taking in all the German culture. It was great. 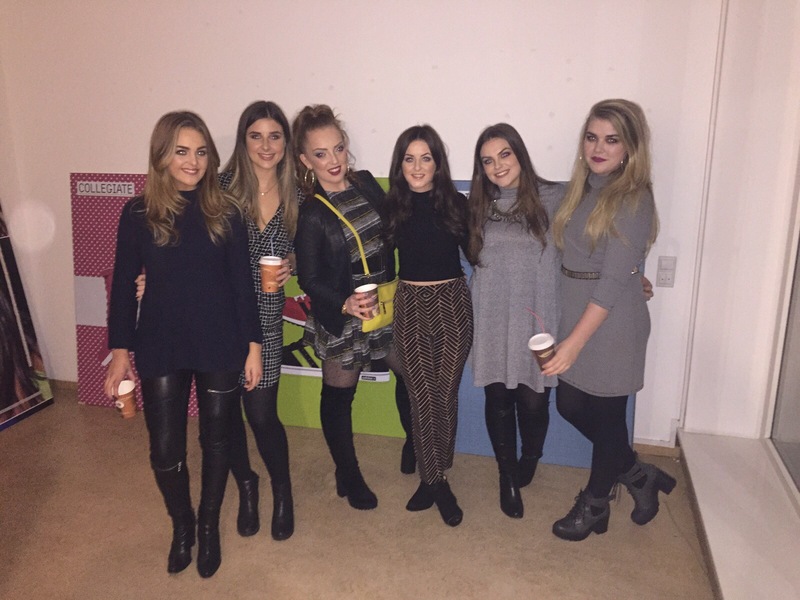 Here’s us just before really taking in all the German culture – aka going to a club to listen to house music & drink. Lots. 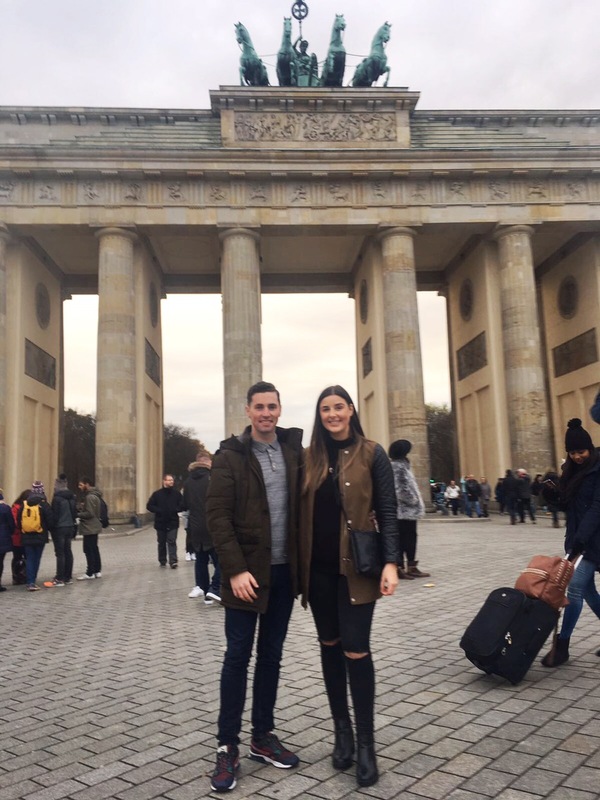 My return back to Germany was a full year later in November 2016, when my boyfriend took me to Berlin for my 23rd birthday. I have a blog post here. I fell in love. Berlin offered a new vibe. Nuremberg was pretty – it had its own type of traditional German culture, but nothing like Berlin. Now in April 2017, me and boyfriend visited Hamburg. 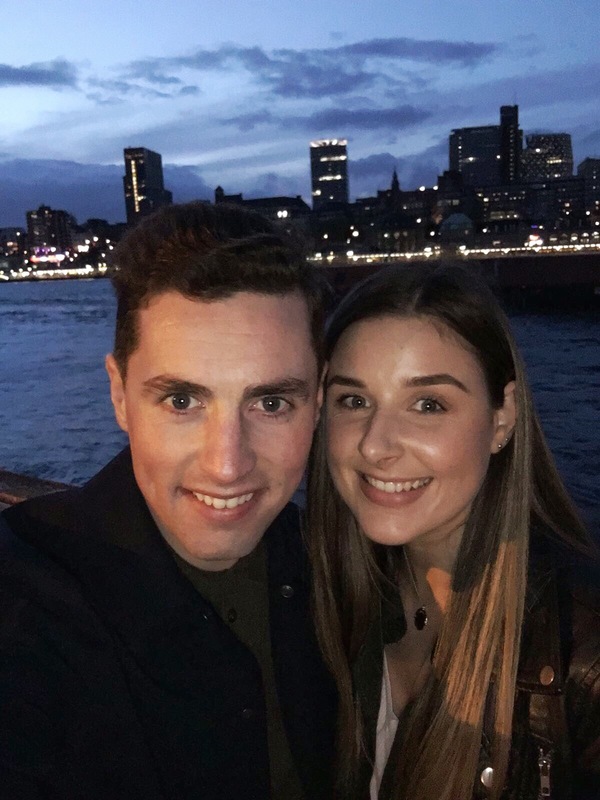 It’s not that we don’t like any other places around the world (as my mum kindly pointed out, there are hundreds of other countries to visit…thanks for that one) however when we were randomly picking a city break on a gloomy dark January night, I was just drawn towards Hamburg. I feel as though there’s not that much hype about Hamburg – what are the main tourist attractions? But now I’ve been, I’ve discovered that what jumps out at me as being a great city break is the feeling of being a local. And if that means eating and drinking to our hearts content in some of the coolest places in the coolest neighbourhoods, then I was all for it. 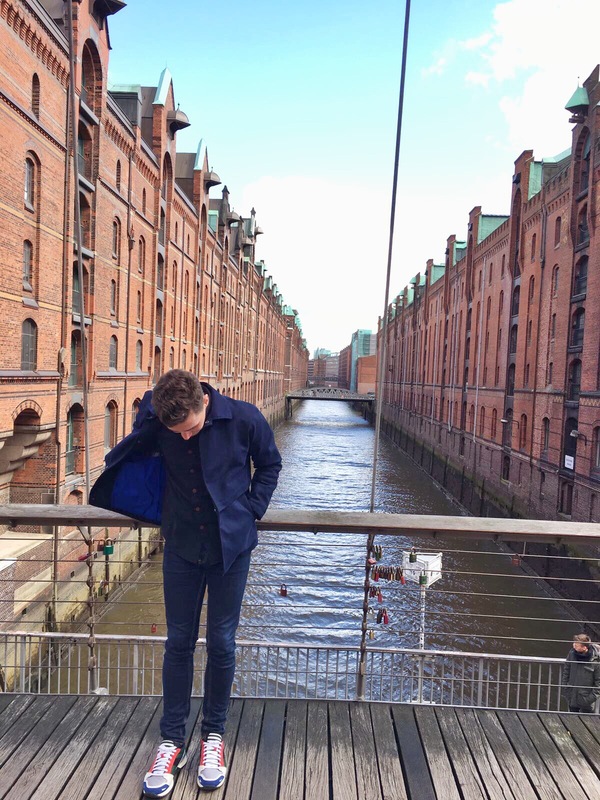 I fully expected myself to create a full tour guide for Hamburg all in this little blog post here but now that I’ve finally come to sit down and write, that’s not the vibe I’m going for. So here’s a few pics of our weekend, with a few insights into what Hamburg has to offer and what made it a great city. How amazing is this walkway. 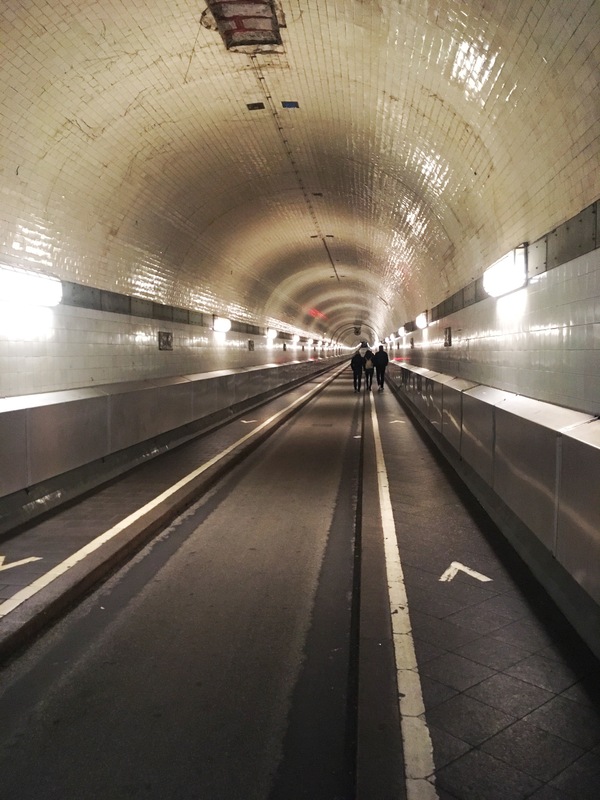 It’s called the Elbe Tunnel (the river it passes under is the River Elbe) It’s actually 80ft underground and it takes you from one side of Hamburg to the other. It allows pedestrians and cyclists to access both sides of the city with ease! So Hamburg gets credit for the creation of the hamburger. So what else to do then go and find a really cool burger joint to have lunch in. 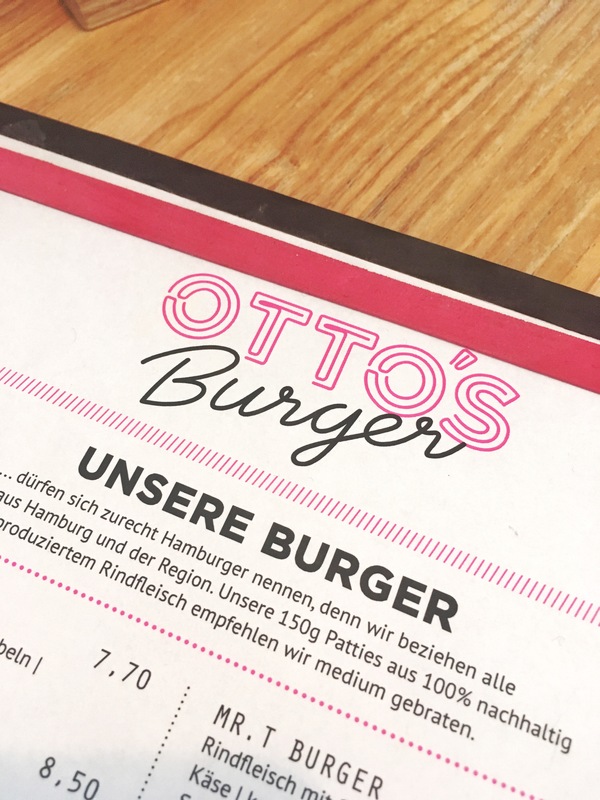 We went to the ‘Otto’s Burger’ that’s situated in the hip neighbourhood of Sternschanze. If you’re ever in Hamburg, you have to go! The burgers are so delicious – they remind me of Almost Famous! 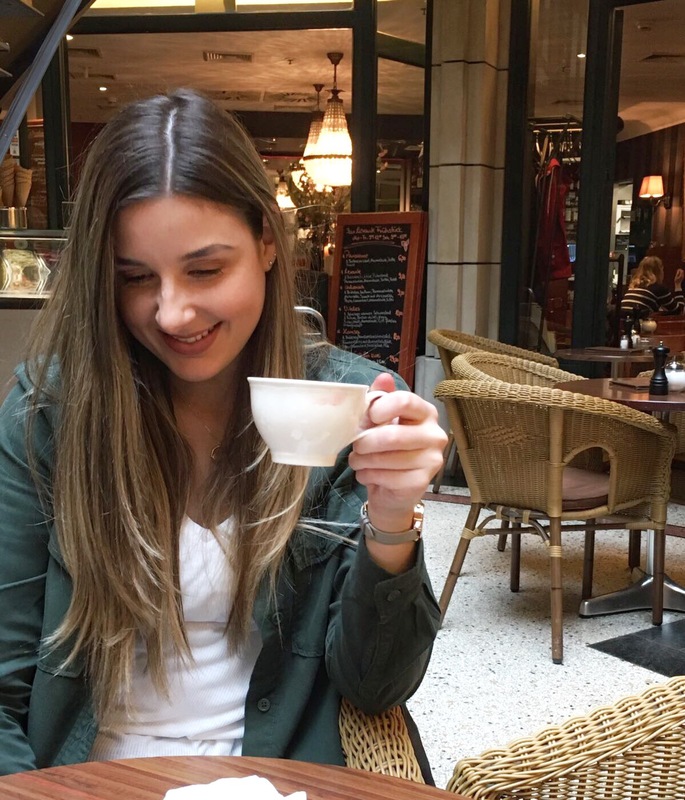 So yes, we ate and drank a lot of food and a lot of coffee (and also gin and beer obviously). 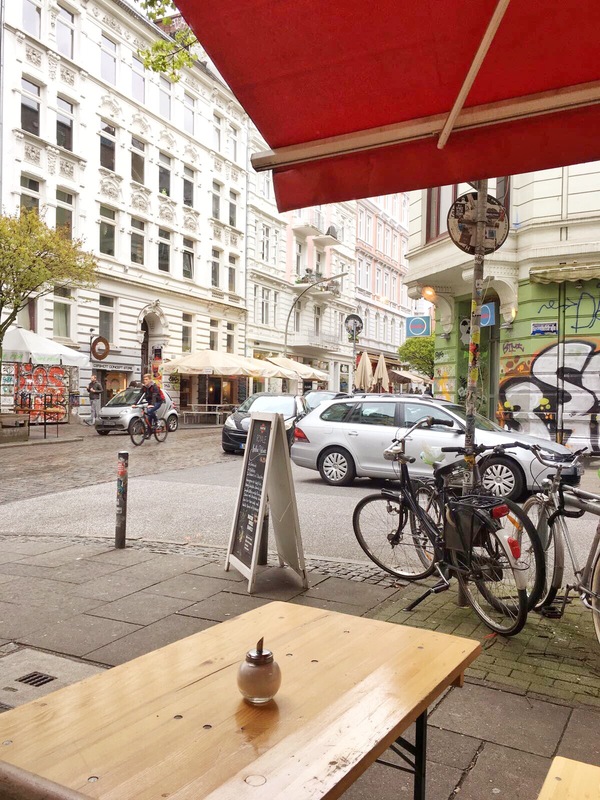 Hamburg is filled to the brim of places to go and hang out and grab a coffee and cake. We stopped for a coffee in a cute little arcade situated just off the main shopping street. Our skyline of Hamburg selfie. This is after we walked through the underground walkway. It was beautiful to see Hamburg from across the river and to see the sun slowly setting over it with all the twinkling lights from cars and buildings. Hamburg is pretty much an industrial port so there are constantly ships and container boats sailing up and down the river but that just adds to what makes Hamburg unique. 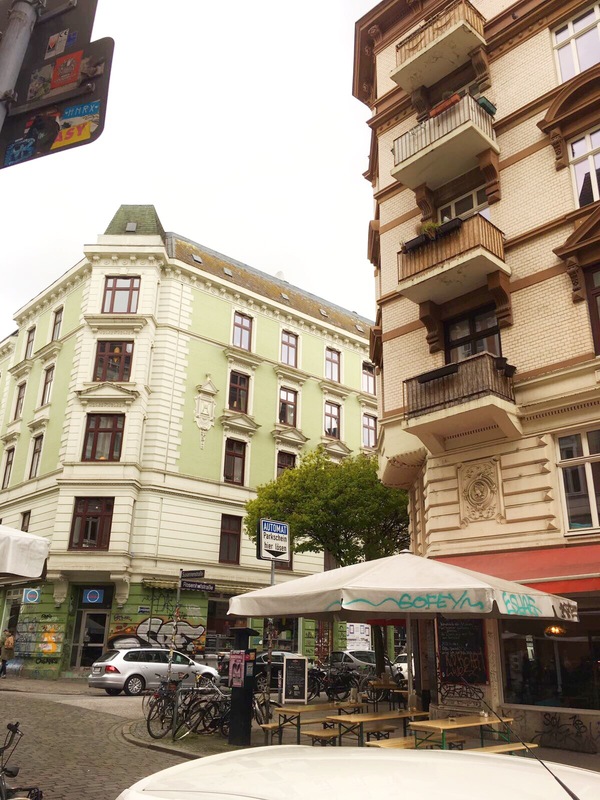 This was the neighbourhood of Sternschanze which I loved the most full of independent stores with an abundance of bars and coffee shops. I love how in Germany there seems to be a balance between old grand architecture and urban living – hence the beautiful grand designs of the buildings with the graffiti art. I feel as though Hamburg is a place where they appreciate any form of art and therefore see graffiti in all its positive and charming glory. Hi, this is Kate in front of the Town Hall with the head of the clock tower cut off. I think I might’ve instructed Alex to make sure my whole body was in the shot – just have to make sacrifices don’t we. This was the town square which reminded me a bit of Amsterdam. 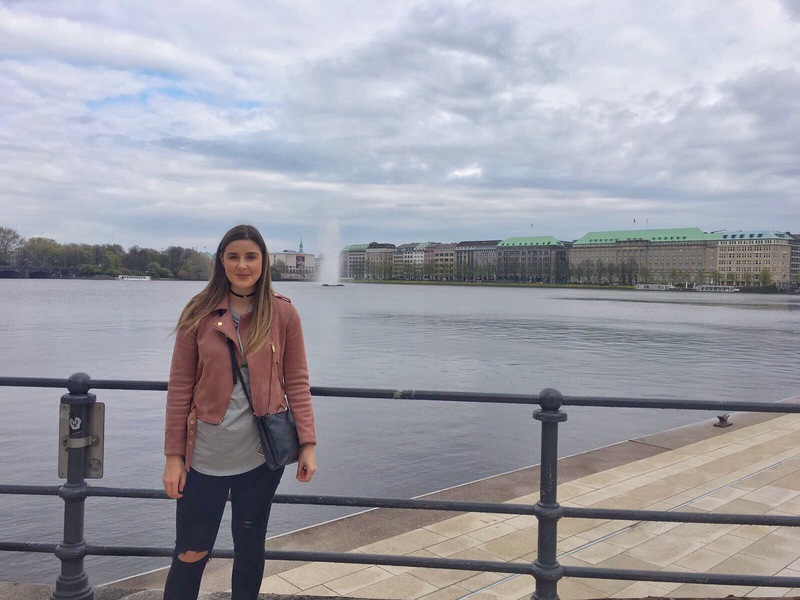 It was situated right by the gorgeous Lake Alster in the centre of Hamburg. 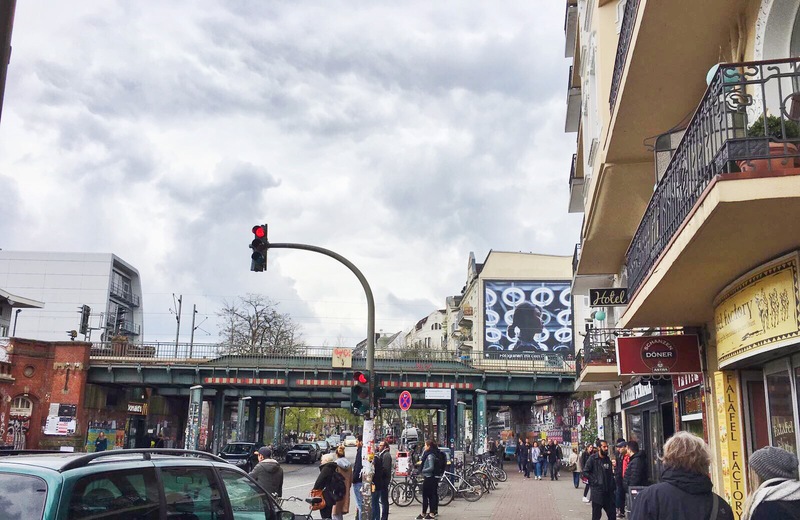 So, if you ever visit Hamburg then it’s probably a given that you have to walk down the infamous Reeperbahn situated in the St Pauli area. It’s Hamburgs version of the Red Light District with bars and adult entertainment for as long as the eye can see. 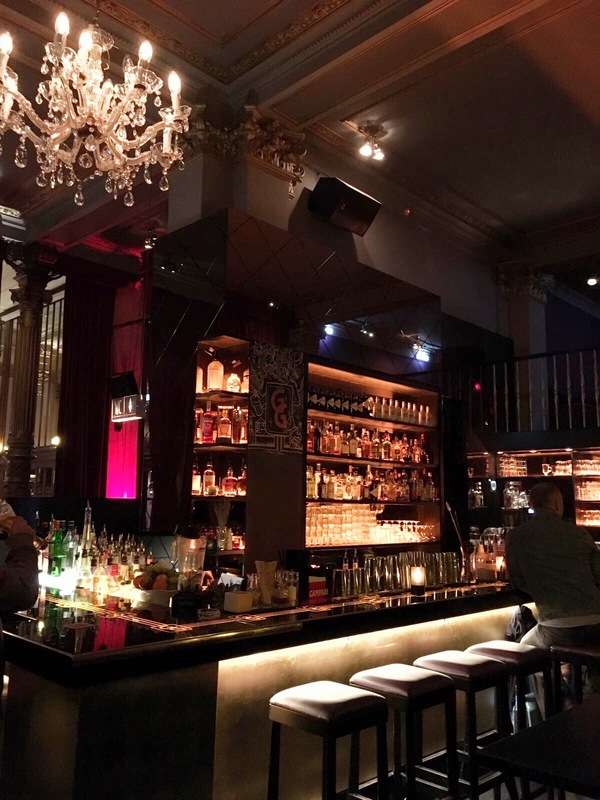 We we fortunate enough to come across this little gem of a bar with offered a very 1930’s American Jazz feel with dimmed lights and great cocktails called Glanz & Gloria. It was situated in the Tivoli Theatre on the main strip. What I loved about Hamburg was that it was all divided and connected by rivers and bridges, again, similar to Amsterdam but a lot more industrial and practical. In the area of Speicherstadt, just before Hafencity, there is the warehouse district which, amazingly, are all built on timber pile foundations. It’s part of the UNESCO World Heritage site and it’s so cool to go and walk around. The area reminds me of my beloved Albert Dock here in Liverpool – built hundreds of years ago and have now been maintained and turned into amazing heritage sites for tourists and locals. It’s also a really good spot for some major photography sessions. 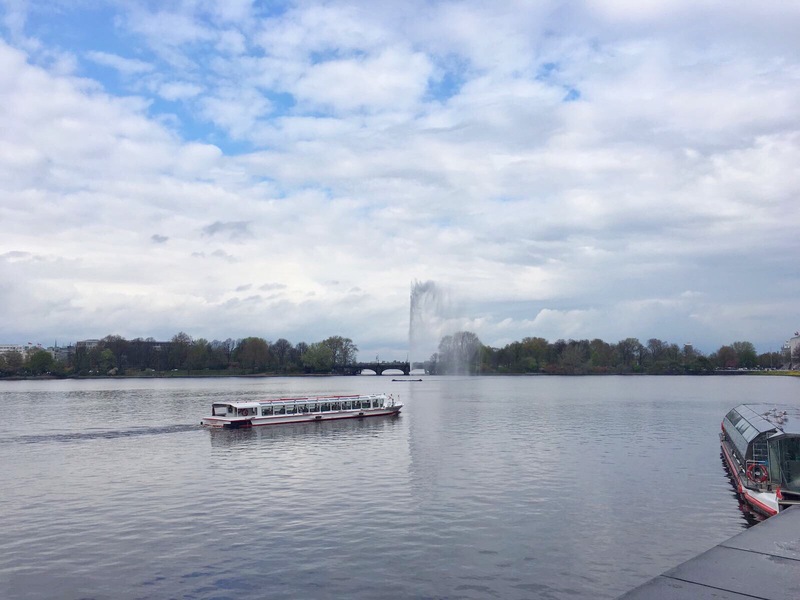 This was Lake Alster. It was gorgeous to walk around and take in the architecture of the buildings that surround it. When the sun was shining, the lake was filled with boat tours, sailing and rowing and people enjoying a bit of peace and quiet from the hectic city life. Has anyone ever been to Hamburg? What was your favourite thing to do there? Enjoyed your blog I think from what you have said I’d like to visit .